New polls from North America’s largest motorist group and biggest trucking trade association show an overwhelming majority of Americans want the federal government to invest more money in roads, bridges and mass transit systems. An Oct. 20 poll from the American Trucking Associations (ATA) showed 60 percent of the polled sample of 800 registered voters believe more needs to spent on infrastructure, with 53 percent believing it will be necessary to raise fuel taxes to pay for needed maintenance – a preferred method over tolling, ATA said. Infrastructure spending is second only to education as the area the public thinks more money needs to be spent on. An Oct. 13 poll by AAA showed 70 percent of Americans believe the federal government should invest more in transportation infrastructure than it does now, and that only 38 percent believe Congress is taking the necessary steps to ensure our transportation systems will meet the needs of the nation. 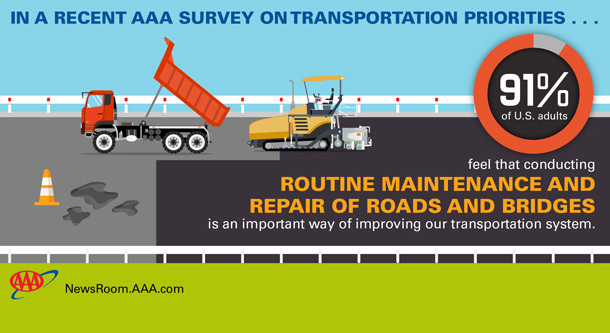 AAA surveyed more than 1,000 U.S. adults. See the full poll.